Wow what an awesome weekend. This is the most participant/family friendly event going around. Two different race length options, teams could be from 2 to 5 members, boats provided, low cost entry and a rogaine format allowing you to participate to your own skill and fitness level. It seemed too good to be true and our team number 002 shows how keenly we signed up. My 11 year old son Noah had done 1 beginner introductory adventure race before and was ready to give it another go. The 2 hours being just right for his experience and fitness. 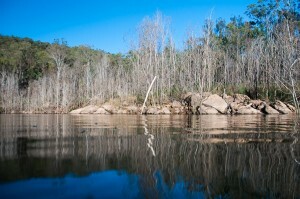 We drove out from Brisbane on Friday afternoon and set up camp at the beautiful Lake Cressbrook. With the 2 hour race starting first it gave us novice teams plenty of time to register and organise our race plans before the 6 hour crowd flooded into HQ. Unlike other events were the race planning feels like cramming for an exam there was a good amount of time to sort ourselves out. We really appreciated this. Leg 1 and we all hit the kayaks. Erren and Jo had done so well to organise these boats which were lighter and handled so well compared with the bath tubs I’ve paddled in other events. With a 50 minute cut off for this leg we set our sights on all but the furthest checkpoint (No 5). Everything was going smoothly until checkpoint 6 which required a short hike. An unmarked trail and a little navigation uncertainty had us questioning how long to spend looking for it. There seemed no easy way through the scrub until we saw another team exit from the lantana. Following their lantana tunnel lead us straight to checkpoint 6 and we were back on track. Heading back to the kayak and Noah tripped falling onto 2 small cactus seedlings. About 20 tiny cactus spikes in his hand and knee brought us to a painful halt. Character building. After removing the small needles and a few deep breaths we had lost time and momentum. We paddled back to transition picking up checkpoint 1 on the way and made it just within the 50 minute cut off. Leg 2 was mountain biking and we knew this was our weakest discipline, only planning to get the closest 3 checkpoints. We ticked 17 and 18 easily and abandoned the rest. We had lost time and preferred to use what was left on the trek leg. Leg 3 and we set off following the lake shore line picking up check point 10 easily. On route to checkpoint 11 and I had a navigational brain failure and sheep mentality moment. We crested a hill and knew the next hill along contained the checkpoint. But with 2 teams heading towards the biggest most obvious hill in front of his we set off after them despite it being the wrong compass bearing. When we crossed the creek which we clearly didn’t need to on the map it caused me some concern but not enough to stop chasing those teams in front and besides we had to go up a hill and this was the most prominent hill. Off the edge of the map we go. At least with 2 other teams nearby we weren’t the only ones making obvious mistakes. When it finally couldn’t be denied we were on the wrong hill a redirection took us directly to check point 11. With more time lost we abandoned checkpoint 12 and quickly headed towards HQ. Strategically we had left checkpoint 13 (10 points) very close to HQ as an option if we had time. We ran through HQ, clambered to 13 and made it back to HQ with less than 30 seconds before cut off. After 2 hours it provided us with a real race against the clock exciting finish. At the presentation and everyone was a winner. Literally there was a small field in the 2 hour and with the number of team categories (male, female, mixed, novice, family etc) we had all placed in at least 1 category. Well done to Erren and Jo for recognising every category and making us all feel like we had achieved. On top of this I won one of the awesome random prize draws so kindly donated by TriRunning Toowoomba. Thank you TriRunning Toowoomba it is a great piece of kit. Post-race meal was another top notch effort with Pizza from the local town and I only wished they could deliver to Brisbane. The race HQ atmosphere was so good Noah preferred to hang there rather than go back to our camping site. 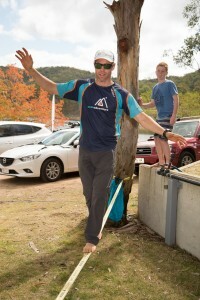 Jarod from Peak Adventure had set up his slack line which drew us all in and kept the kids amused for hours. As Noah and I helped out packing up after the 6 hour event we both noticed how many families were doing the 6 hour event. They stood out for me as the families participating had the biggest smiles and were undeniably focusing on the fun and family experience. Noah and I are ready to sign up for the 6 hour next year as this was the highlight of our year. Thank you so much Jo, Erren, Liam, the volunteers and the sponsors Tailwind (will be giving this a go), TriRunning Toowoomba and Johny Sprockets Bike shop. Jonny Sprockets is our favourite local bike shop and has been a long time supporter and preferred supplier to MOJO Adventure… they are all about great service, great products and the some of the best prices you’ll see anywhere! If you’re looking for a new bike they can set you up with anything from kids balance bikes through to high end TT bikes plus the best mountain bikes on offer world wide! Jonny Sprockets also carry a full range of parts and accessories, they can also make your whip run like new having on staff some of the best bike mechanics in the game. The Jonny Sprockets team will be on hand at the MOJO|Rogue|SIX to answer any questions you might have about your bike. There will also be plenty of products you can see firsthand and even purchase at race HQ. Plus, being a major sponsor, Jonny Sprockets are also donating some awesome prizes for competitors in the MOJO|Rogue|SIX… it will be worth signing up for the race just to get your hands on some dope product! You’ll find the Jonny Sprockets website here and their Facebook page here. Heres how it started…an incessant crazy incorrigible ideas big picture adventure junkie (me) and a grounded detailed awesome designer (but also somewhat adventure addicted) team mate decided after 4 years of racing as MOJO Adventure that we may be able to put on a race for a few friends. Step 1 Run a training event for a few teams on the hottest day on earth last October. All good, more teams than we thought, everyone survived (just). Processes learned and refined – lots. Do it again! they all told us. Step 2 Big picture person says – we could do a proper race. Grounded team mate agrees = success. Lets talk to Liam St Pierre… he seems to know what he is doing. Step 3 Meet Liam at the pub, discover he is as crazy as we are, we may be onto something, I think this is a thing. Step 4 Decide to run race under the banner of QRA. This is a great organisation and Liam has worked well with them… race day proposed. Step 5 Permits and planning – Liam takes the lead and guides us through the perils of permits, It was pretty easy actually and it was good to see how the process worked. Step 6 Find some boats… OOOHHH what’s that? 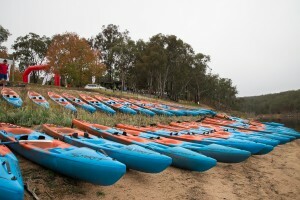 Jarad Kohlar from Peak adventure will be coming back from XPD with his boats? Perfect timing = WIN! 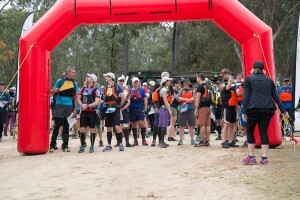 StepA 7 Maps and course vetting – I can’t lie, this was probably our favourite part exploring the awesome terrain that the teams raced in, getting stalked by council (we had permission- it just hadn’t been communicated to everyone). StepA 8 Promotion and event release – Finally the entries opened… we thought 30 teams would be cool… nearly 70 teams later = GOBSMACKED! StepA 9 Course setting – hanging the tape here there and everywhere, making up those awesome descriptions we all love to hate… find the saddle in the middle of the lantana guys… Mwahahaha. Step 10 Gear for the race – emailing Paul Guard 20000000 times. (each time he replied gracefully and swiftly – thanks so much Paul!) Fun trip to Brisvegas to buy our start arch and get a million water containers and flags and heaps of other cool stuff from the Aladdin’s cave that is the QRA shed. 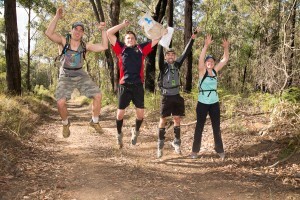 Step 11 Sponsor love – we are so grateful for our awesome sponsors TriRunning Toowoomba, Jonny Sprockets Bike Shop and Tailwind. The prizes gave the race a little extra ZIIING!! Special thanks to Aaron for his mentorship and believing in us. Step 12 Race week… So much to do! 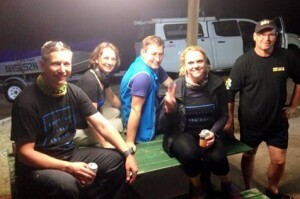 We broke up the ‘have to do’ admin stuff with the being in the bush… at night until 1230am… Ha! Even had pumpkin scones and tea, and a farm tour on the back of the ute with our awesome land owners who let us use their property. I was pretty sick all week so also grateful to the pharmacist for those special codral with its nice kick along ingredient. Step 13 Race Day – quickest trip to the Dam I have ever done following the white Hilux… we will blame adrenalin I think! So many people, so many amazing volunteers and so many boats. The place was buzzing, we were buzzing, the generator was buzzing… then everyone went to race and it was quiet. Step 14 Logistics of race day – it would be great to say it ran perfectly from our end but we had a few little hiccups. I don’t think too many people would have noticed in the end but it has been good to reflect back on how it ran and review tactics for next time. Step 15 The race was over! We packed up and had a beer with a storm lighting up the dark sky in the distance and water of the dam glistening in the moonlight. Step 17 Exude gratitude to everyone that contributed, seriously, if you helped in any way, big or small, we thank you!! Step 18 Get back into training and spend some time with our families. Step 19 The date is penciled in… the course for next year is forming in our heads. Other cool events and sponsors are also appearing on our radar… Let the adventure begin… AGAIN!!! Step 20 Putting on this race was a most epic journey in itself, from it’s inception nine months earlier to when we closed the gate at the ski club after the day was over. A journey that was enriched by the people that imparted their knowledge along the way, to the old friends we spent time in the bush and on the water with, to new friendships that were formed along the way… we are truly thankful. Our families have been a great support in allowing and empowering us to take on what is predominately a labour of love. We felt honoured that so many people would hand over their hard earned money to take part in a race that we received so much enjoyment putting on. We were equally amazed by the number of first time adventure racers taking part as well as some legends of the sport! As we catch up on family, work and sleep our minds continually wander to the future and the awesome task of putting on this event in 2016, to the exciting races we’ve scheduled to take part in and catching up with both familiar friends and friends we haven’t met yet in the adventure racing family.